Let’s be Frank. (Or not.) What happened to Rizzo’s? Lunchbox Laboratory’s Scott Simpson’s not the only owner of a little beef-centric hole-in-the-wall to lately blow out of Ballard. 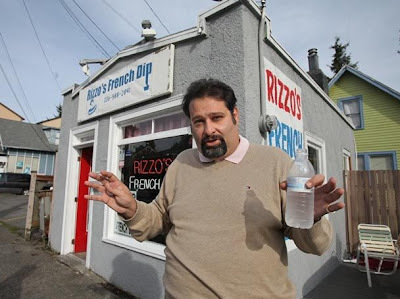 Remember Kenny Johnson (aka “Frank Rizzo”) whom, you’ll recall, got a hero’s welcome elsewhere in the Seattle Times — as well as here on the blog? Eater Liz McCarthy does, and yesterday she sent me this query: “Anyone find out what happened to Rizzo’s French Dip? I was surprised that he closed and was wondering what happened. Especially after hearing about his heroism a month or so ago.” Well, Liz, here’s your answer, courtesy of Seattle Times reporter Maureen O’Hagan: read it and weep.